I don’t know about your family, but my husband loves March Madness. Any excuse to watch a championship game is fine by him! 🙂 With the big game taking place on a Monday night, that leaves us with the challenge of putting together a weeknight meal. Yes, the easy thing to do would be to order a pizza, but where’s the fun in that? 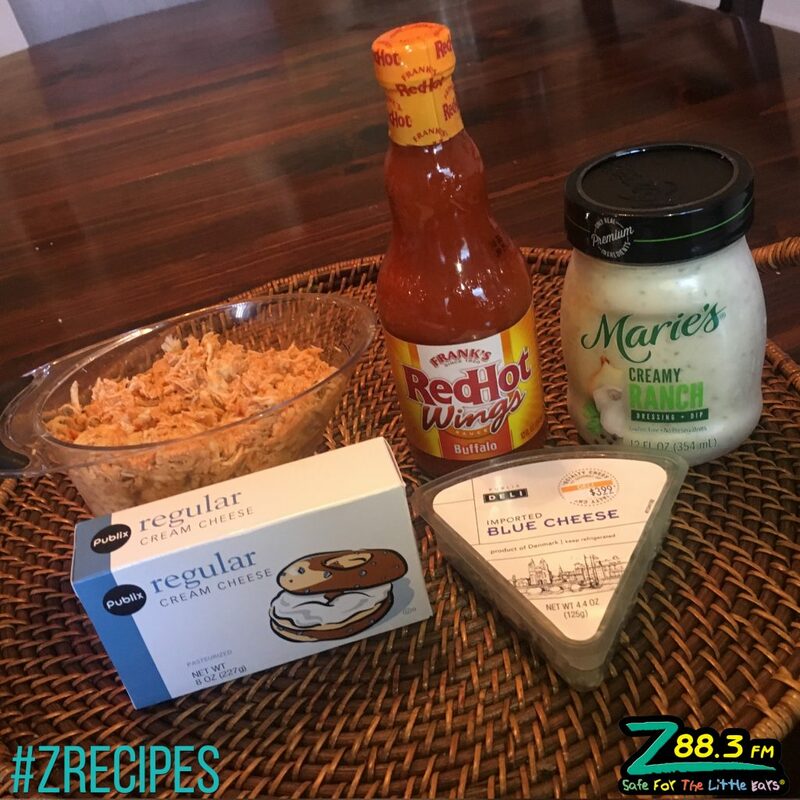 😉 Your entire family can get in on the action with this fun game night recipe…the best part is this Buffalo Chicken Dip is both a hot, bubbly cheesy dip and dinner all in the same dish! Not into March Madness? 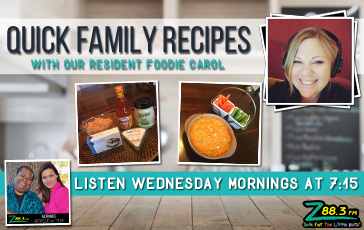 You can also use this recipe to turn an ordinary weeknight into a fun, family game night! So, what if you let the kids plan the game night for your family and eat dinner WHILE you are playing? That’s what this awesome Quick Family Recipe allows you to do. Your kids won’t forget sitting around the table playing games and eating dinner at the same time together. It may seem like such a small thing to us, but I promise, your kids will think this shake up to dinner will be the coolest thing ever. In our house it was always Uno or Scrabble as I got older. My dad used to play Candy Land with me when I was younger. I loved playing with him because I always beat him. I could never beat my mom…I figured out one day that he was letting me win and that was the end of that! I was so upset. It’s still brought up around the dinner table when we get together on holidays. 😉 Such fun memories! 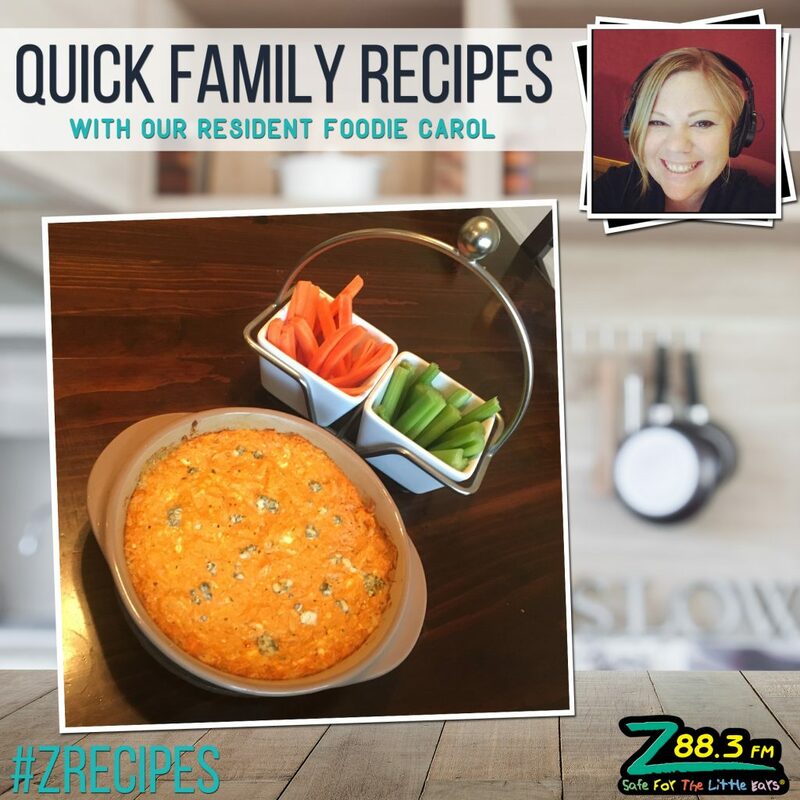 Serve With: Carrots, Cucumbers and Celery sticks…Oh My! 🙂 If you aren’t worried about the low carb life, add in a package of Hawaiian rolls to make awesome mini slider sandwiches with the dip! 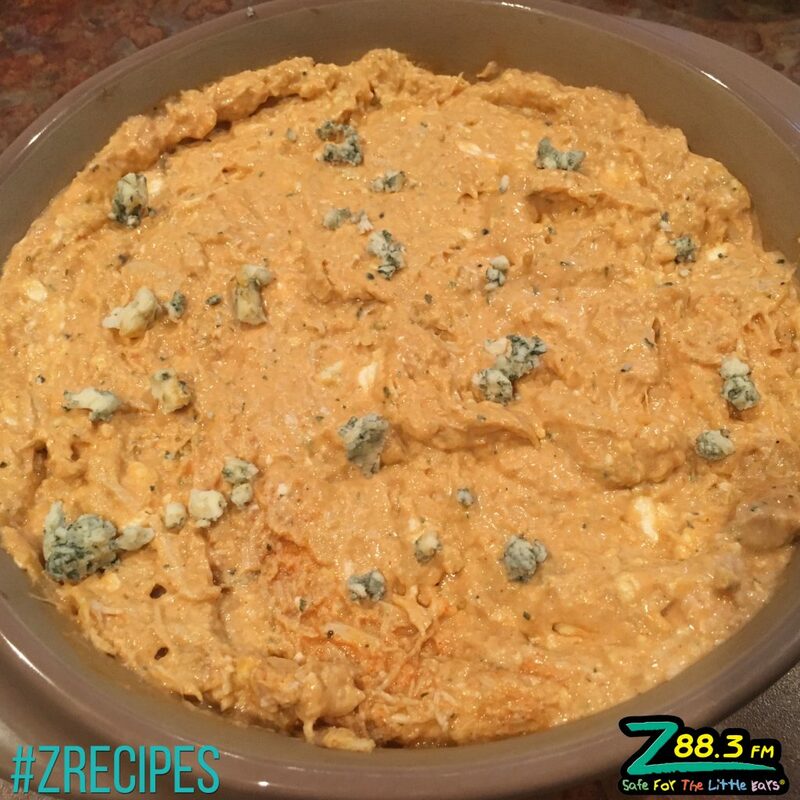 Have your kids add the 2 cups of chicken, box of softened cream cheese, buffalo sauce and ranch into a mixing bowl. Give them a wooden spoon or spatula and let them go to town! All they have to do is mix all the ingredients together very well. It will look like a giant cheese ball when it is ready. 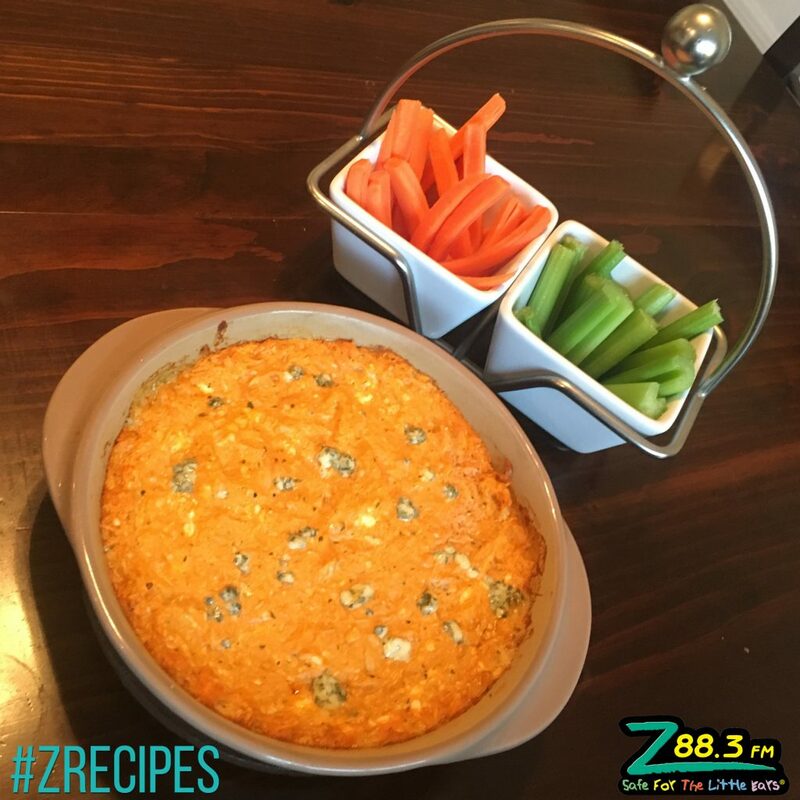 Transfer to an oven safe dish and spread evenly and sprinkle blue cheese on top (if your family is on the adventurous side! Bake on 350 Degrees for 20-25 minutes until your dip is bubbly and browning! Serve with your celery, cucumbers and carrots or make sliders with the Hawaiian Rolls. We’d love to see a picture of your family enjoying game night while eating this dish…just post your pics using #ZRecipes.